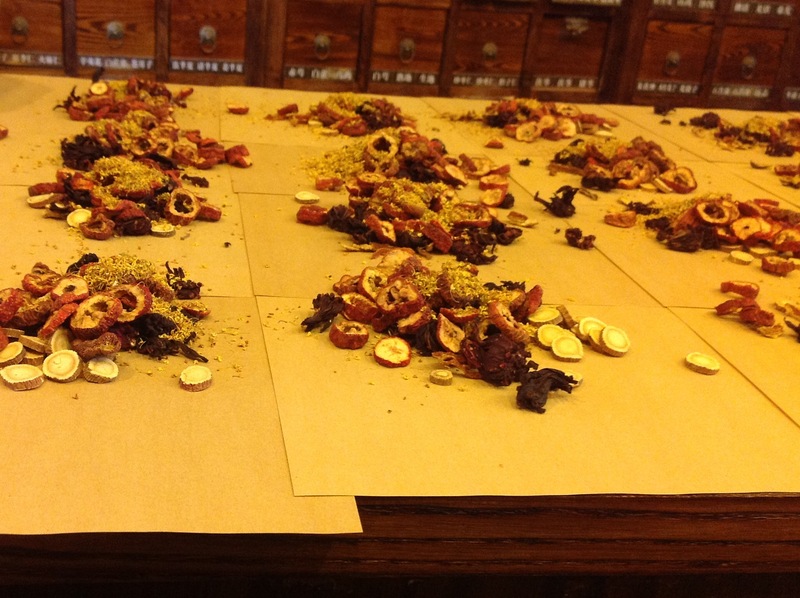 Traditional Chinese medicine waiting to be packaged. Recently, while touring the Dong Cheng District of Beijing, Jerry and I walked past a building that was really fragrant. The scent stopped me in my tracks and I looked around trying to determine what smelled so good. I couldn’t tell what the source was at first, so I decided to at least take a picture of the door knocker of the building so I could share the picture with my family in the USA. While taking the picture, I asked Jerry why it smelled so good. He told me that it was a Traditional Medical Doctor’s office and pharmacy. Jerry asked me if I wanted to step inside for a peek. Since it smelled so good outside, I just had to Go inside. We walked inside and it didn’t look like any doctor’s office that I had been to before. The inside of the building was bathed in warm golden light and smelled like a combination of teas, spices and wood. I watched as several people weighed out traditional medicines onto papers. I took a picture of one of the groups of medicines as they were waiting for the papers to be folded into bags. The door knocker for the building. The pharmacists didn’t actually weigh the individual ingredients, so much as accurately put pinches or handfuls on the papers. Now I understand why some people can recreate food recipes accurately without measuring cups or scales. They have done the recipe so many times, that they remember how much to add. Watching the hands fly over the papers depositing ingredients was amazing. I’ll try to go back to take a video. I recognized Hibiscus in the ingredients, but I didn’t recognize anything else. Do you recognize anything on the papers? I see dried ginger root! I, too, see ginger root. I’d love to know what the rough-textured rings are! What a wonderful adventure you’re having! My favorite post from last week? The comparison of the vegetable emulsifier! It was really very helpful. Are those little drawers behind the papers? the ingredients permeating the wood. Wow…..so different from the USA! it could be dried ginger root, but it could be burdock root as well, it looks the same cut open and dried. so does ginseng, although i doubt they’d add in in such huge chunks as the stuff is as expensive as gold. i’m trying to figure out the fruit looking slices. from where the holes are, maybe dried persimmon? although i’m not sure if it would dry like that. crabapples maybe? i definitely see some mushrooms and the yellow strawy stuff looks suspiciously like calendula petals which i’m sure they are not. it looks beautiful though, almost like a really pretty potpourri and i would love to get a whiff of what it smells like! What a great experience! I’d love to go and see/smell all the herbs. Thanks for sharing this and I hope you return to video this for us again! Made me wish I could experience the smell and experience for myself. thanks for sharing this with us! Loved the door knocker also. This must have been an amazing adventure! Isn’t it great seeing such an influential part of another culture? I’m jealous!!! Thank you so much for this story, I can practically see and smell this place from your description. I wish I could be there! 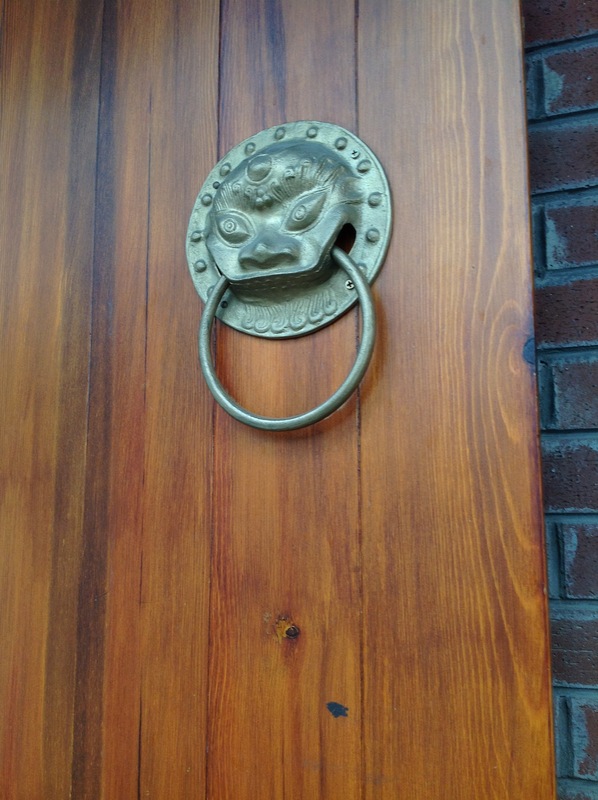 Love the door knocker, too. Could that be some dried, sliced lychee? And rosehips? I sure wish that smell o’vision was available on this one, could almost smell the place with the way you described it. What an adventure, all the memories you will take with you, including the smells and the way that they help with the memories. Yes, if you can get a video, that would be so cool. Wow! I don’t recognize anything on the papers, but that’s really fascinating! It kind of reminds me of something that my acupuncturist would give me as a treatment – he’s licensed in Chinese medicine. I often have to ask him, but what IS this? And he often has trouble explaining that part to me because it’s usually something I’ve never heard of before. Looks like slices of wood and some fruit maybe? I have no idea. What fun to see the traditional Chinese doctors office! Fantastic door knocker, too.